Your child’s first years are very important. Good health, loving relationships, and opportunities to learn will help your child reach his or her greatest potential. 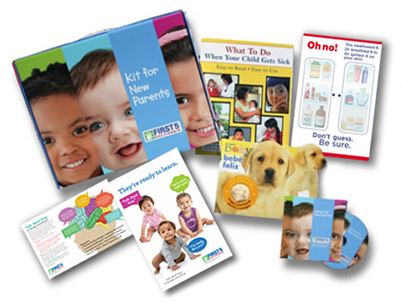 The Kit for New Parents helps parents and caregivers develop positive relationships with their children. It is designed for the whole family. The Kit for New Parents is only available for San Mateo County, California residents. PLEASE DO NOT SUBMIT A FORM IF YOU DO NOT LIVE IN SAN MATEO COUNTY CA. If you do not live in San Mateo County CA, you will not be mailed a kit. If you submit a form and do not live in San Mateo County CA, you will not be mailed a kit. PLEASE DO NOT SUBMIT A FORM IF YOU DO NOT LIVE IN SAN MATEO COUNTY CA.